Prefer jpeg or pdf format @ 300dpi. Online version is full color, print version is black & white. Please submit in color and we will convert to b/w (hint: dark colors on dark colors does not always print well). Newsletter ads includes a free listing on our website event calendar. If it's not possible to supply an ad for the newsletter the charge would be the same as a 1/4 page ad to be listed on the website event calendar ($35). Newsletters will be mailed and invoices will be emailed the 1st of each month (payment due upon receipt). Deadline is the 20th of each month prior to publication. 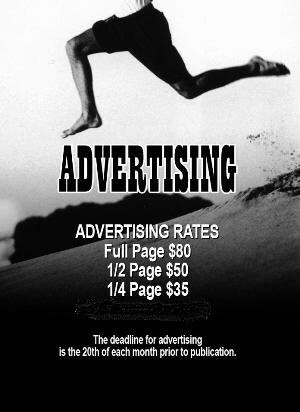 Contact us today at advertising@okcrunning.org or call Chuck @ 405-942-9900. And don't worry! You don't have to be a "writer" to submit an article! Just send in your story, and we'll do the rest!